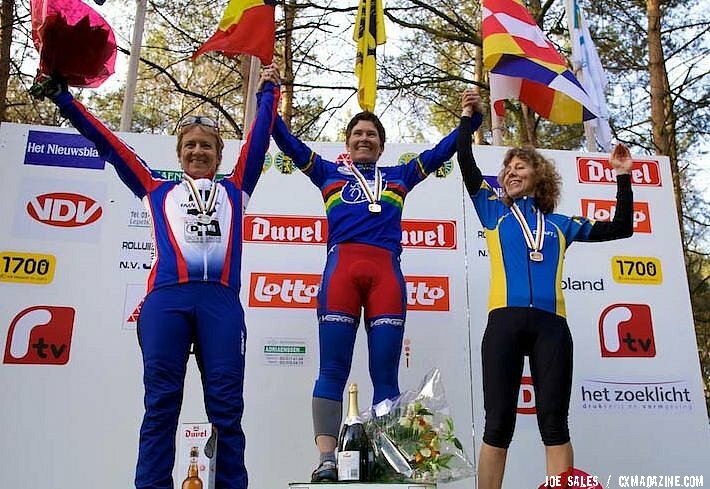 Got dreams of winning the blue-and-rainbow-striped jersey at the 2012 Cyclocross Masters World Championships in Louisville? Although we presented much of this criteria earlier in our reports from the USA Cycling Promoter’s Summit, the official criteria is out and it’s time to study up to make sure you qualify and meet the rules. This season, it’ll be interesting to watch the masters-age men and women at UCI races as some will have to keep track of their position to avoid earning points. Will we see long track stands before finish lines to avoid earning points? Full press release below. 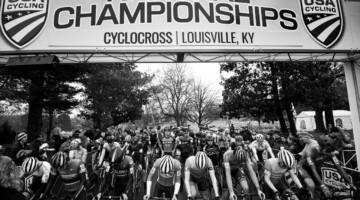 June 3, 2011 (Louisville, Kentucky) – The eligibility guidelines for participation in the 2012 UCI Masters Cyclocross World Championships, scheduled for Jan. 12-15 in Louisville, Kentucky, have been announced. 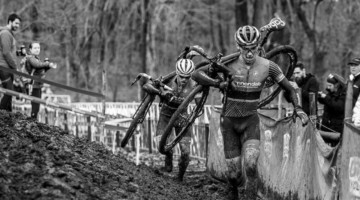 · Rider must be of cyclocross racing age of 30 or older. 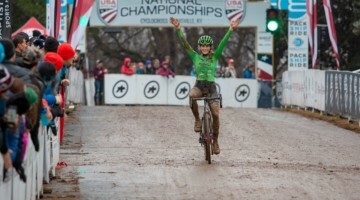 · Riders who appear in the UCI cyclocross rankings or have earned UCI points in the 2011-2012 season are ineligible for the Masters World Championships. 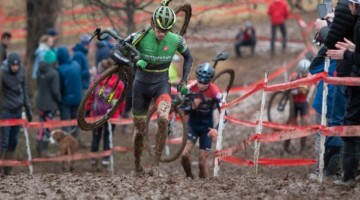 · Riders who participated in the UCI Elite Cyclocross World Championships, Continental Cyclocross Championships or any UCI Cyclocross World Cup during the 2011-2012 season are ineligible to compete at Masters Worlds. · Any rider who has been a member, during the 2011-2012 season, of a team registered with the UCI in any discipline is ineligible for the Masters World Championships. · There will be no ability category restrictions in order for riders to compete. All racers will be required to hold a 2012 International Racing license. For US-based Masters age racers unaccustomed to this requirement, USA Cycling recommends beginning the application process as soon as the 2012 licenses will be available for purchase on December 1, 2011. The international license allows riders to compete in domestic road, mountain bike, cyclocross and track events; therefore riders will not need to purchase a separate domestic license for the 2012 season. The application process requires several steps including a signature on the international license athlete release form and proof of nationality. Riders will need to make sure the signed waivers and proof of citizenship are submitted to and processed by USA Cycling well in advance of the event. If these are not received and processed, the rider will be ‘pended’ in the system and will not be allowed to compete. What are the additional steps? 1. Once the international license has been purchased online at www.usacycling.org, riders will be prompted to download, sign and submit the athlete signature page. This may be submitted to USA Cycling via fax, email (scan) or postal mail. 2. Provide a copy of your birth certificate or valid passport for proof of citizenship. If a rider is just renewing their international license, they do not need to provide a proof of citizenship if it’s already on-file with USA Cycling. 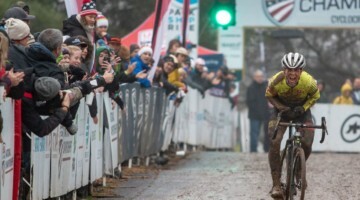 The UCI Masters Cyclocross World Championships have a UCI-mandated field limit of 80 riders. For fields with greater than 80 registrants the UCI Cyclocross Commission has determined that short heats will be installed, with a limit of 60-70 riders per heat and a maximum of eight heats, and a ‘repechage’. Start order for the World Championship final will be according to the results of the heats. 1) Call ups for all qualifying races will be random draw. 2) For fields greater than 75 riders a three-lap heat race will be contested. The number of heats will be determined by the total number of riders registered. In the heats, riders will be called up by random order in the same method as mentioned above. The finals will be raced with 80 riders with five coming from the Repechage. The Repechage is open to all racers who did not qualify for the Finals coming out of their qualifying heat. 3.) For the World Championship Final, riders will be called up by their order of finish in their heats (all first riders of the different heats, all second riders of the different heats and so forth). 4.) A second final – or Consolation Final – will be raced to determine finishing places 81-onward. The random draw will be conducted on-site at registration. The rider who draws number 1 will be called up first and so on. Riders will draw their own numbers. The events will take place in Louisville’s, Eva Bandman Cyclocross Park on January 12-15th, 2012 and January 29th-February 1st, 2013 and will mark the first time in the history of the sport the UCI Cyclocross World Championships will take place outside of Europe.The events in Louisville represent a historic first for the sport of cyclo-cross; never before in the 60+ year history of the sport have the Cyclocross World Championships been held outside of Europe. For more information about travel, hotels and things to do in Louisville please visit www.Louisville2013.com. Recognized by the United States Olympic Committee and the Union Cycliste Internationale, USA Cycling is the official governing body for all disciplines of competitive cycling in the United States, including road, track, mountain bike, BMX and cyclo-cross. As a membership-based organization, USA Cycling comprises 66,500+ licensees; 2,200 clubs and teams; and 34 local associations. The national governing body sanctions 2,650 competitive and non-competitive events throughout the U.S. each year and is responsible for the identification, development, and support of American cyclists. To learn more about USA Cycling, visit www.usacycling.org. And how much does all this cost ???? Dont forget riders from outside the USA have travel and hotel expenses as well.